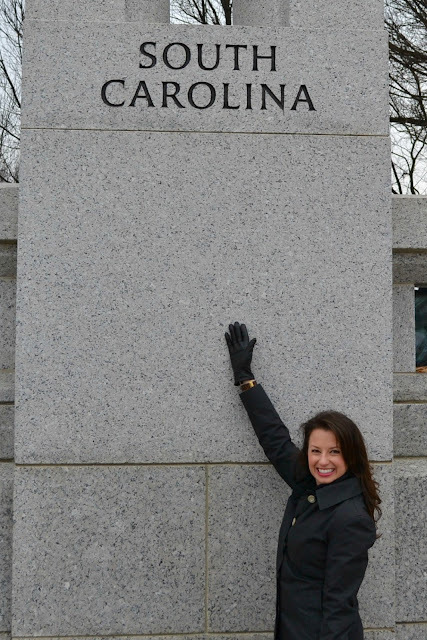 Christmas for me this year was all about two big firsts ... my first time spending the holidays with my husband's family, and my first ever trip to Washington DC! As much as I travel during the year for work, DC is just never one of those stops. Guilt was starting to creep up on me -- I was so ready for an all-American trip. Time to see the White House in all it's glory! We ventured into the city on Christmas Eve. It was chilly and misty (which later turned to rain, then freezing rain, and then even some snow flurries). We were bundled up with coats and boots. 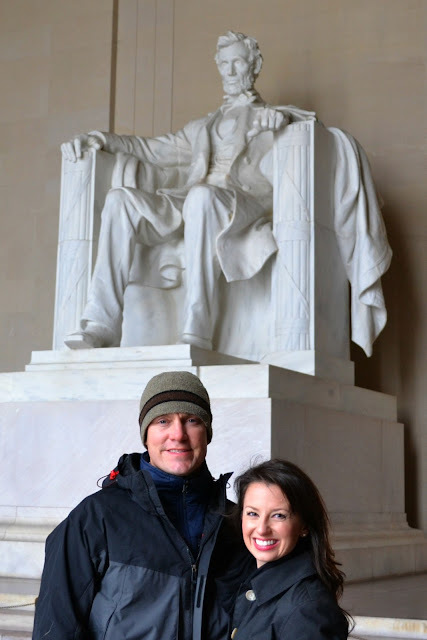 We started at the Lincoln Memorial -- probably my favorite part of the day. Our lovely tour guide for the day was Ian's cousin Megan, who did a perfect job of taking us around. We made our way to the Korean War Memorial. We then kept working our way down toward the Smithsonian. I'm very proud to say that my Papa stormed the beaches of Normandy on D-Day. He was also one of the very fortunate ones that lived to tell the tale. When the weather got chillier, Ian bought hot chocolate for us girls and we made our way to the National Museum of Natural History. It was different than I imagined ... I was surprised to see that it was a blue diamond and that it was in a setting. My mind's eye had it clear and in a round brilliant cut, unset. Our nephew was so excited to see the Titanoboa exhibit ... a 48-foot long snake. Rest assured, it existed 65 million years ago. The remains were discovered in a Columbian coal mine. From there, we made our way to the National Air and Space Museum, where Ian was in heaven. He especially loved the WWII aircraft exhibit. I loved getting to drive through Georgetown (so cute, quaint, and hip!) and also see our nation's capital. Christmas Day, we got ready and all gathered around to start opening gifts. We took a break to have a big Christmas lunch with a turkey and lots of sides. When presents resumed, our niece opened the adorable mink coat and beret (faux!) that I got her for her American Girl dolls. Ian's grandparents are just the best. My heart beamed when I saw that they have our Christmas card from last year framed on the shelf. We truly had a wonderful visit, and the next morning we awoke to a snow-covered ground! How lucky are we. It made the drive home a bit nerve-wracking, but the most important part is that we made it home safely. It was a lovely Christmas and I can now check another item off of my list of cities to see. DC ... done and done! Happy New Years Eve to all of you, and I can't wait to see what sort of glitter-filled evenings you all have. I must have been a good girl this year ... Santa brought me a new big daddy camera! My Christmas wishlist mentioned this desire, and apparently Santa reads my blog. Without further ado, here are a few glimpses from our home this Christmas. This is the first year that we went faux. 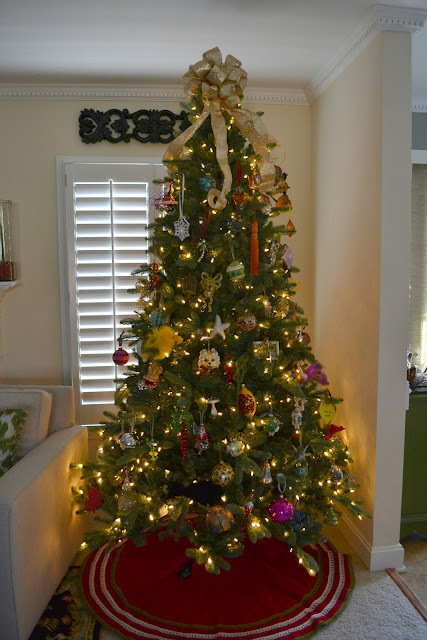 It took a little convincing for me, but after our "pros" list outweighed the "cons" list, we pulled the trigger and got a Martha Stewart line tree from Home Depot. We'll use it until our future bambino(s) are at a good age to go to a Christmas tree farm and remember it. Then, it's time for a real tree again. This is probably my favorite ornament -- a yellow glass bird with a wild plume of feathers for the tail. Orange tassel found on after-Christmas clearance last year at World Market. Another favorite, a glass mermaid from a previous Christmas trip to Southport, North Carolina. This year we debuted our gorgeous new stockings on our mantle -- even a small one for Drake! Mom made these for me and I'm going to get them monogrammed for us this year. On our mantle, I have a gold leaf garland (Michaels), gold deer (Target), and red berries (Dollar Tree) added to our hurricane candle holders (Pottery Barn). This ornament tree houses my Swarovski ornaments, which I collect each year. My first ornament is from 2002, and I've got one for every year since. I was thrilled to have some of our holiday decor photos featured on The Enchanted Home. Tina showcased tons of beautiful holiday photos -- click here to see the mega post and some really beautiful and inspiring photos.